The men above, and many thousands like them, are better men than I. I never served my country, never went in harm's way. I regret that. For most of my life my eyesight was horrible, up until I had lasic surgery late in life. My childhood dream of serving in the US Navy was never to be realized. Alan Seeger was a Harvard Graduate, Class of 1910, who wrote stunning poetry, including the famous war poem "I Have a Rendezvous With Death." He joined the French Foreign Legion to fight in World War I. He was killed on July 4, 1916 by German machine gun fire as his French Foreign Legion unit charged German positions near Belloy-En-Santerre, France. General George S. Patton was an aggressive American general in World War II who won many victories for the allies. My Uncle served under his command, as a private and medic in the 2nd Armored Division. Patton was killed in December 1945, just after the war had ended, in a jeep accident. Doris Miller, a Navy sailor and cook, was a crew member of the USS West Virginia at Pearl Harbor when the Japanese attacked on December 7, 1941. As Japanese planes dove all around the ship, dropping torpedoes and bombs, Miller found a loaded machine gun that had been dropped on the deck. He picked it up and began firing at the Japanese planes, possibly downing one, until he ran out of ammunition. Cited for his bravery in the heat of battle, Miller was awarded the Navy Cross. He was killed in action later in the war. John McCrae, a Canadian officer in Europe during World War I, was a surgeon who treated the wounded in the Flanders section of Belgium. Outside of his dressing station was a makeshift cemetery where red poppies naturally sprouted in the freshly overturned soil of the graves. McCrae was inspired to write possibly the most famous war poem of all time, "In Flanders Fields." McCrae later died of pneumonia before the war's end. Pat Tillman, a professional football player who abandoned a lucrative sports contract to serve his country, died in Afghanistan by "friendly fire." Pat's father was my youngest son's coach in Pony League baseball in Almaden Valley in 1993-94, and I saw Pat once at one of the practices. William E Shipp, a lieutenant in the US Army, served with the Tenth Cavalry during the Spanish-American War. He was killed in the charge up San Juan Hill on July 1, 1898. Nathan Hale, Captain in the Continental Army, served in the Revolutionary War for American independence. He was hanged by the British as a spy on September 22, 1776. Reportedly his last words were "I regret that I have but one life to lose for my country." John Morreale, Staff Sergeant in the US Airforce in WW II, was a radio operator with a 10-man crew flying a Boeing B-17 Flying Fortress. He was one of the men who flew combat missions from bases in England to Germany, bombing Nazi munitions factories, railroad yards, and submarine pens in preparation for the June 6 invasion. His bomber the "Fancy Nancy III" was shot down over Brunswick, Germany on January 30, 1944. Five members of the crew were able to bail out before the plane crashed. Unfortunately, Sgt Morreale was not one of them. 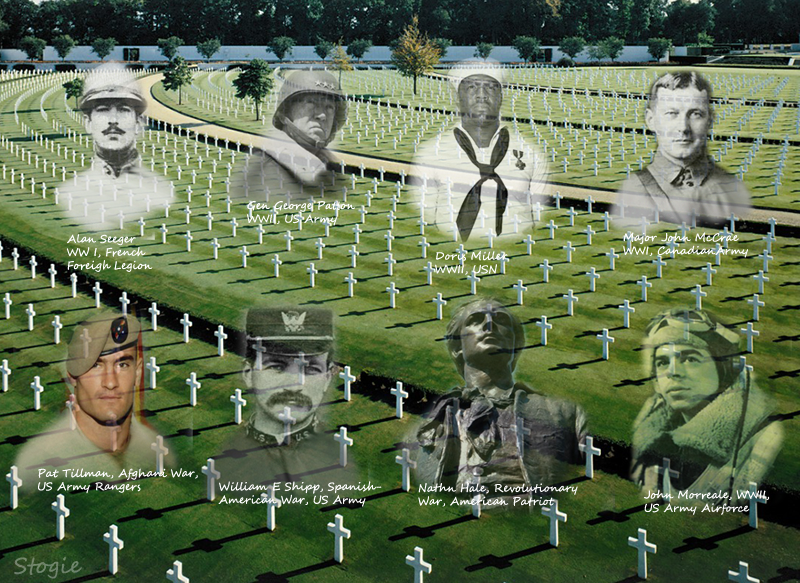 These are but a very small few of the American and allied heroes who gave their lives in war. Each of the thousands of white crosses in military cemeteries around the world represents one precious human life. They gave all of their tomorrows for all of our todays. Let us never forget what their lives have bequeathed. Well done -- in words and with the post's graphic. I love that Seeger poem, and my class reads it in the British Literature course. That I admire Patton goes without saying. I'm particularly fond of "The Patton Prayer." I'm sure that you're familiar with it. PS: I love the masthead that you created for this Memorial Day. Yes its like most of us. We do consider and acknowledge that these are surely better men. Celebrating their lives and holding memorial day every year is something which not only give us opportunity to say something about them but also remind us that there are some better men serving for our country. The Daily Beast is Actually the Daily B.S. The Song Feminists Hate: "Wives and Lovers"
The Sphinx: Beard or No Beard? You Decide! Hollande, Captain of the Titanic? Cinco de Mayo!! Hola, Hispanics!